One thing that is true about physics is that it involves a lot of mathematics. What this means is that we often use the mathematics to help us visualize what is going on in the world. But like I said in an earlier blog, this ‘vision thing’ in math can sometimes let you mistake the model for the real thing, like the case of the electron. The same problem emerges when we try to understand an invisible thing like space. The greatest discovery about space was made by Einstein just before 1915 as he was struggling to turn his special theory of relativity into something more comprehensive. Special relativity was his theory of space and time that described how various observers would see a consistent world despite their uniform motion at high speeds. This theory alone revolutionized physics, and has been the main-stay of modern quantum mechanics, as well as the designs of powerful accelerators that successfully and accurately push particles to nearly the speed of light. The problem was that special relativity did not include a natural place for accelerated motion, especially in gravitational fields, which are of course very common in the universe. Geometrically, special relativity only works when worldlines are perfectly straight, and form lines within a perfectly flat, 4-dimensional spacetime (a mathematical arena where 3 dimensions of space are combined with one dimension of time). But accelerated motion causes worldlines to be curved, and you cannot magically make the curves go straight again and keep the spacetime geometrically flat just by finding another coordinate system. Special relativity, however, promised that so long as motion is at constant speed and worldlines are straight, two different observers (coordinate systems) would agree about what they are seeing and measuring by using the mathematics of special relativity. With curved worldlines and acceleration, the equations of special relativity, called the Lorentz Transformations, would not work as they were. Einstein was, shall we say, annoyed by this because clearly there should be some mathematical process that would allow the two accelerated observers to again see ( or calculate) consistent physical phenomena. He began his mathematical journey to fix this problem by writing his relativity equations in a way that was coordinate independent using the techniques of tensor analysis. But he soon found himself frustrated by what he needed in order to accomplish this mathematical miracle, versus his knowledge of advanced analytic geometry in four dimensions. So he went to his classmate and math wiz, Marcel Grossman, who immediately recognized that Einstein’s mathematical needs were just an awkward way of stating certain properties of non-Euclidean geometry developed by Georg Riemann and others in the mid-to-late 1800s. This was the missing-math that Einstein needed, who being a quick learner, mastered this new language and applied it to relativity. After an intense year of study, and some trial-and-error mathematical efforts, he published his complete Theory of General Relativity in November 1915. Just like the concept of spacetime did away with space and time as independent ideas in special relativity, his new theory made an even bigger, revolutionary, discovery. It was still a theory of the geometry of worldlines that he was proposing, but now the geometric properties of these worldlines was controlled by a specific mathematical term called the metric tensor. This mathematical object was fundamental to all geometry as Grossman had showed him, and allowed you to calculate distances between points in space. It also defined what a ‘straight line’ meant, as well as how curved the space was. Amazingly, when you translated all this geometric talk into the hard, cold reality of physics in 4-dimensions, this metric tensor turned into the gravitational field through which the worldline of a particle was defined as the straightest-possible path. An interesting factoid, indeed, but why is it so revolutionary? All other fields in physics (e.g like the electromagnetic field) are defined by some quantity, call it A, that is specified at each coordinate point in space and time: A(x,y,z,t). If you take-away the field, the coordinate grid remains intact. But with the gravitational field, there is no background coordinate grid to define its intensity, instead, the gravitational field provides its own coordinate grid because it is identical to the metric tensor!! So, imagine a cake with frosting on it. The frosting represents the various fields in space, and you can locate where they are and how much frosting is on the cake from place to place. 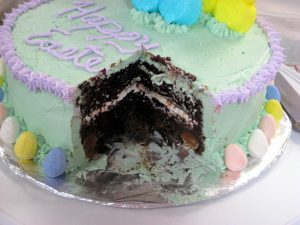 But the bulk of the cake, which is supporting the frosting and telling you that ‘this is the top, center, side, etc of the cake’ is what supports the frosting. Take away the cake, and the frosting is unsupported, and can’t even be defined in the first place. Similarly, take away the gravitational field, symbolized by Einstein’s metric tensor, and spacetime actually disappears! Amazingly, Einstein’s equations say that although matter and energy produce gravitational fields, you can have situations where there is no matter and energy and spacetime still doesn’t vanish! These vacuum solutions are real head-scratchers when physicists try to figure out how to combine quantum mechanics, our premier theory of matter, with general relativity: our premier theory of gravity and spacetime. These vacuum solutions represent gravitational fields in their purest form, and are the starting point for learning how to describe the quantum properties of gravitational fields. They are also important to the existence of gravity waves, which move from place to place as waves in the empty spacetime between the objects producing them. But wait a minute. Einstein originally said that ‘space’ isn’t actually a real thing. 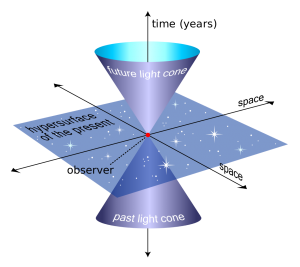 Now we have general relativity, which seems to be bringing space (actually spacetime) back as something significant in its own right as an aspect of the gravitational field. To see how some physicists resolve these issues, we have to delve into what is called quantum gravity theory, and this finally gets us back to some of my earlier blogs about the nature of space, and why I started this blog series! Check back here on Wednesday, December 21 for the last installment on this series about space! Previous PostIs Infinity Real?Next PostQuantum Gravity…Oh my!